Vacheron Constantin is the world's oldest manufacturer of fine watches. Founded in 1755, the company has been witness to the evolution of luxury watchmaking. It has excelled through out the years by never wavering from the very highest standards of excellence and style. As one of the world's most venerable watch makers, Vacheron Constantin has played an important role in offering innovation and technology to the industry. * In 1770, the company produced its first complication watches. * Vacheron Constantin produced the first engine-turned dials and the first ever six quarter-repeater watches, striking the hours and the quarters upon request. * In 1839, supervisor of manufacturing operations, Georges-Auguste Leschot, standardized movements into calibers, an accomplishment that revolutionized the art of watchmaking. * Leschot later went on to pioneer additional technology, such as creating the pantographic device that allowed mechanical reproduction of certain watch parts. * The To-and-Fro calendar watch offers a to-and-fro, 31 day calendar mechanism which is visible from both the back and front of the case. This watch design has become one of the company's most popular lines. Patrimony: Power Reserve The Power Reserve watch from the Complications collection features a new dial with a lined guilloché pattern. Available in yellow gold and white gold, it has a self-winding movement and is water resistant to 30 meters. 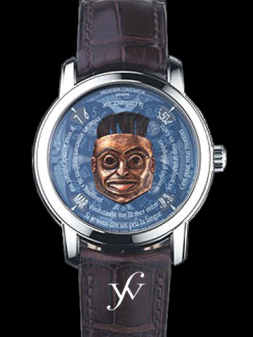 The hours, minutes, and seconds show at 6 o'clock, and the date and power reserve are indicated on the face. Les Essentielles: Ladies 1972 This elegant collection has maintained a focus on the 1972 series. The ladies watch is an asymmetrical design adorned with a braided 18 K white or yellow gold Milanese Mesh bracelet. This is a knitted metal fabric that is supple and stylish. Bedecked with a row of brilliant-cut diamonds on the case, this watch is made for fashion and formal wear. Malte: Perpetual Calendar Chronograph Available in either platinum or 18-karat rose gold, the Perpetual Calendar Chronograph features a 31-day retrograde readout. It has a manual winding movement and shows the hours, minutes, and seconds at 9 o'clock. The date, day of the week, month and leap year indicator, and moon phases are also viewable. This watch is water resistant to 30 meters.